Description of "Śrī Bhagavat-Sandarbha Vol. 1"
Śrī Bhagavat-Sandarbha (also known as Ṣaṭ-sandarbha) is a collection of six works on the philosophy and ontological position of Śrīmad-Bhāgavatam. 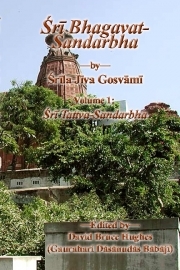 Compiled by Jīva Gosvāmī based on extensive notes by Gopal Bhaṭṭa Gosvāmī, it is a complete exposition of the philosophy of Lord Śrī Caitanya Mahāprabhu. Tattva-sandarbha is the first volume of this series, and is meant to be read in conjunction with our online video class series. Bhakti-sarvabhauma Śrī Gaurahari Dāsānudās Bābājī (aka David Bruce Hughes) is one of the greatest exponents of the Esoteric Teaching, the science of higher consciousness, in the world today. David is a prolific, deeply thoughtful and provocative author, a Vedic astrologer, and an evocative spiritual musician, composer and recording artist, with many books and CDs on themes of devotion and spiritual life. He spent over 30 years at the feet of his exalted guru, studying the esoteric Vedic wisdom in the most sacred places of pilgrimage in India. He is also a profound spiritual Master Teacher and an engaging presenter who has held audiences all over the world spellbound with his fascinating talks. He combines an inclusive, broad-minded analytical approach to spirituality with the transcendent faith and passionate devotion of the Vedic line. He says, "The direction of my life was set at age three, when I sincerely prayed to the Lord to send me a teacher on the level of Jesus Christ so I could learn how to have a direct personal relationship with Him." For more information, visit the Esoteric Teaching website. Reviews of "Śrī Bhagavat-Sandarbha Vol. 1"